Number of poles. AC motor windings. One of the characteristics of an alternating current motor (AC motor) is the number of rotor poles. This data will automatically give the number of windings that the motor has: # windings = # poles x 2. If a motor has 4 poles, then the motor has 8 windings. If a motor has 6 poles, then the motor has 12 windings. The windings that have an AC motor are divided into two groups. Group A and group B (see diagram). All the windings of each group are connected in series, forming two large windings. These two large windings differ from each other in that the voltage that feeds them are 90 ° out of phase. 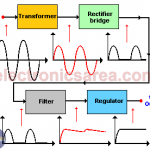 This phase shift is achieved with a capacitor and is the phase shift that exists in adjacent windings in the motor. In the diagram, the supply voltage is E = E sin (wt + 90 °). As in the rotor the poles are fixed and in the stator the polarity of the fields varies (it is connected to an alternating current voltage), the fixed poles of the rotor follow the polarity variations of the windings of the stator. There are effects of attraction and repulsion of the magnetic fields, which cause the rotation of the rotor. As the stator supply voltage is periodic, then the movement of the rotor (rotation) follows this periodic variation of the supply voltage and as a consequence the speed of rotation is constant. Ns = engine speed in rpm (revolutions per minute). f = frequency of the power supply in Hertz (Hz). p = number of pairs of motor poles. The more poles an engine has, the lower its rotation speed is. (see the formula). 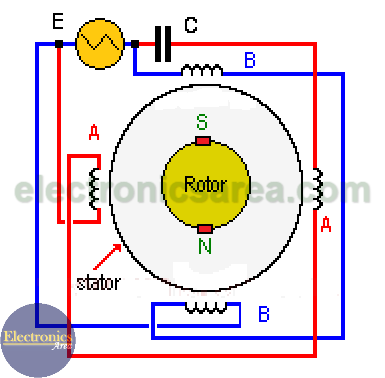 If the rotor can not follow the stator variations, it stops rotating. (This can happen because a very large load is connected).